MADRID (AP) — Portuguese coach Miguel Cardoso got off to an embarrassing start as manager of Celta Vigo on Tuesday, mistakenly thanking rival Deportivo La Coruna for hiring him. Cardoso got the team’s name mixed up during his official introduction, saying “Real Club Deportivo” — instead of Real Club Celta — in a news conference. He made the blunder during his initial speech, with the team’s president and a director sitting by his side. 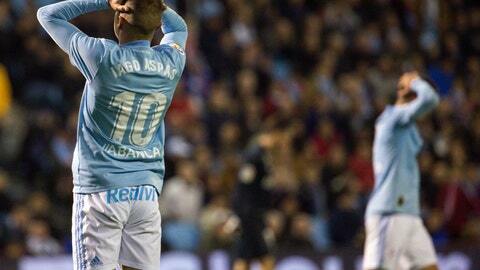 He immediately noticed the gaffe and changed to “Real Club Celta,” but the damage had already been done. The video of his mistake quickly made it to social media, with fans from both clubs commenting. Cardoso was an assistant with Deportivo, Celta’s historic rival in northwestern Spain, during the 2012-13 season. He was hired by Celta on Monday to replace Argentine manager Antonio Mohamed, who was fired after the team’s 4-2 home loss to Real Madrid in the Spanish league on Sunday. Cardoso arrived a month after being fired from French club Nantes, which won only one of its first eight games under him. He previously led Rio Ave to its best finish in the Portuguese league. Celta won only three of its 13 matches under Mohamed, who was hired at the end of last season on a two-year contract. Mohamed was the third coach fired in the Spanish league this season, following Leo Franco (Huesca) and Julen Lopetegui (Real Madrid).